So, as we're getting ready for our last competition of the season, I need to catch up (a month later) and mention Montello. 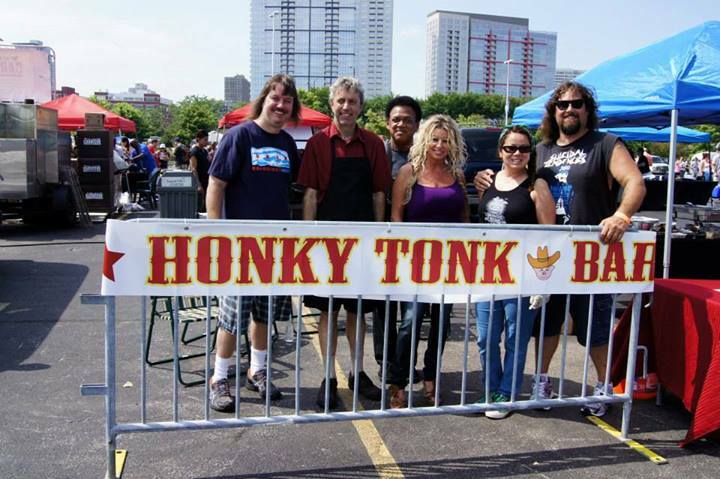 Great venue, had never been there before, but we had a great time, and had awesome neighbors! 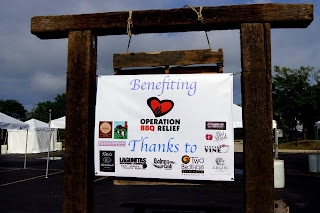 This one was held at family owned Lake Arrowhead Campground, just outside of Montello, WI. 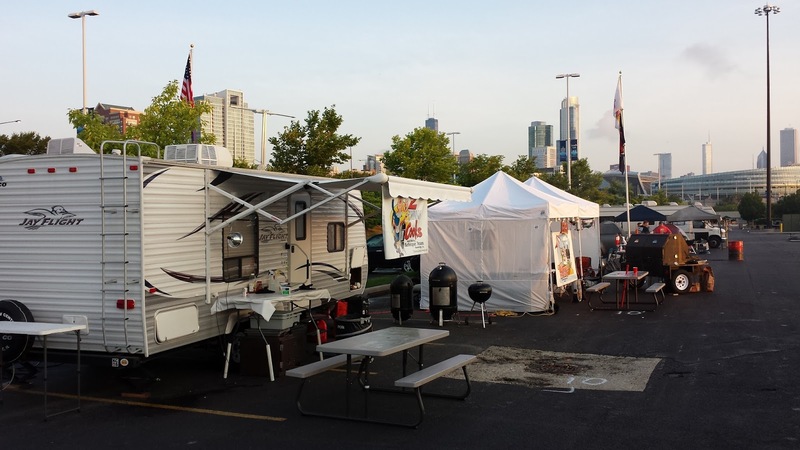 It's primarily an RV park, but, as with a few other comps, they hosted a BBQ comp on what would otherwise have likely been a slow weekend for them. Full power and sewer accommodations, and free wireless made it that much nicer. Only challenge was getting into the spots. We're mainly used to comps on the street, or in public parks. The one other RV park we've competed in was a little more modern, and laid out with mostly pull-through campsites, meaning, you don't need to worry about backing into a spot with mature trees on either side to scrape up your rig! This location was a bit older, so the sites did require backing in to set up. We've had our camper since 2012, and used it twice that year, 5 times last year, and this one would be our 5th of 6 this year. I wasn't doing too well with backing in, and fortunately, one of the guys who lived and worked there full time was kind enough to streamline the process for me so it didn't take 90 minutes to set up! The contest organizer, Jessica Malsak did a great job running the whole event, making sure there were lots of activities and fun stuff going on, but keeping things running smoothly at the same time. Thursday, once we got things set up, I ran up the road to a little bar & grill not too far up the road to get a pizza to go, ( at Jessica's recommendation)and settled in to watch the Green Bay Packers play the Seattle Seahawks. Didn't go well for Green Bay, and in the midst of Wisconsin, you could imagine there were lots of unhappy packer fans that evening. Final was Seattle, 36 - Green Bay 16. Ouch! So, next day, things went pretty much according to schedule, with no unforeseen surprises. Friday evening, we made our usual "shot fairy" rounds, and enjoyed a rare 9:22 PM shot with T-Mac Smokers, who invited one and all! So, Saturday morning, got up at about 4 AM and got the brisket in, then checked on the butts, which were almost done by about 8. Also got the ribs going around 6, a little early, and it ended up costing me. By 11:30, I had the ribs resting. I'd let them go a bit too long, and they were almost falling apart. Figured a rest in a vented cambro might tighten them up a bit. It did, but it would turn out not enough. Our chicken went in right on time. I think I shot myself in the foot for trying to get more variety in the box. No photo of that one! So next was ribs. Already said they were overdone. Going into putting the box together, I figured I'd be happy just to get 6-8 ribs in the box and not having any fall apart!. We managed it, but the texture wasn't good. All in all, although there were issues, we both felt happy with how the cook went, and once that last turn in was done, knowing we were going to stay until morning, went inside to cool off and get cleaned up before awards. So....overall, we could have certainly done better. 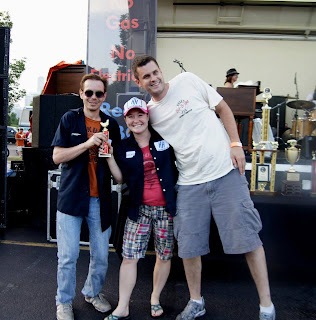 Chicken and Ribs killed us, being 31st in chicken out of 40, and 34th of 40 in ribs. But we knew we were going to have issues in those categories. 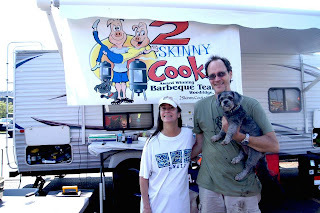 In the long run, we're finally feeling like we're starting to get back on track, after our old trailer had a new failure of some kind on each contest in 2011, and we were derailed in 2012 by a cancer diagnosis. 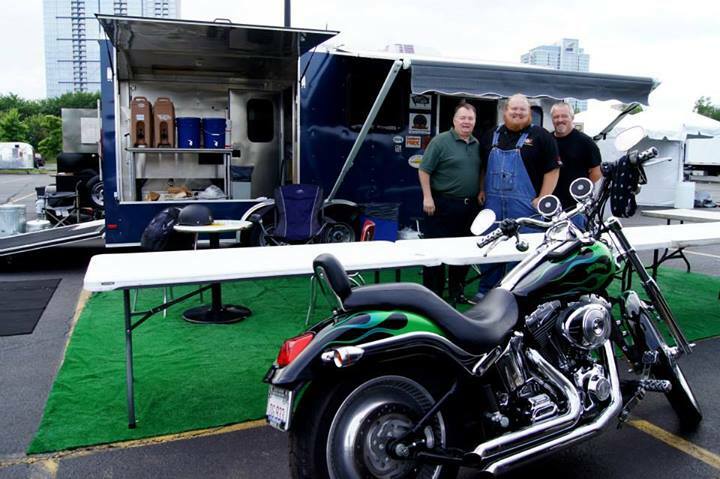 Most of the 2013 season was spent getting used to the new RV, and recovery of my palate, which chemo pretty much destroyed! This year, we're once again getting more attuned with our timing and flavor profiles, and I can actually taste things again. And, thankfully, on 9/28 I marked my second year cancer free! Now, just one more to go. Our last comp is coming up in Arthur, IL, just a little south of Champaign/Urabana, in Amish country! More to come! Finally a little traction! 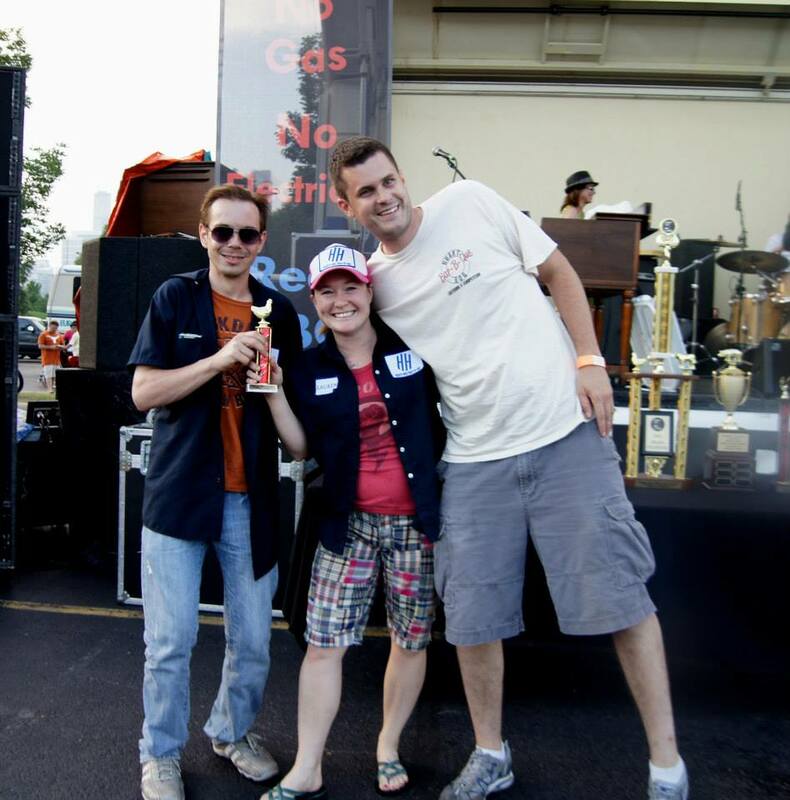 We ended up 18th overall of 47 teams in the Kenosha Grill Games event. At least we're back in the top half! 6th place dessert, 10th place chicken (our first top ten in that category in a LONG time, and 13th place brisket. None of those was worth a check, but we did pick up a ribbon for the trophy rack on the chicken. 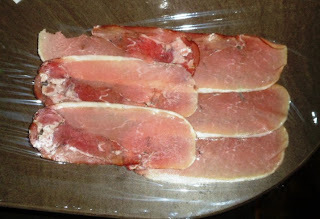 The pork was just so-so, placing barely in the top 2/3 at 28th of 47. We have been playing with chicken for a long time, and have lately been scoring better with our appearance scores, but hadn't started hitting in taste until this time a slight change was made, and it seemed to help a lot! Our scores were 878 988 999 998 988 989 and we got about the nicest comment card I could ask for! There was one big change here, and that was the brine and injection we used. We'll try it again next time out and see if we do as well! In case you can't read the comments, it got all 9's, and the judge said "I loved the presentation of the two bites. Perfectly cooked! Our ribs and pork were about middle of the road, brisket was 13th. 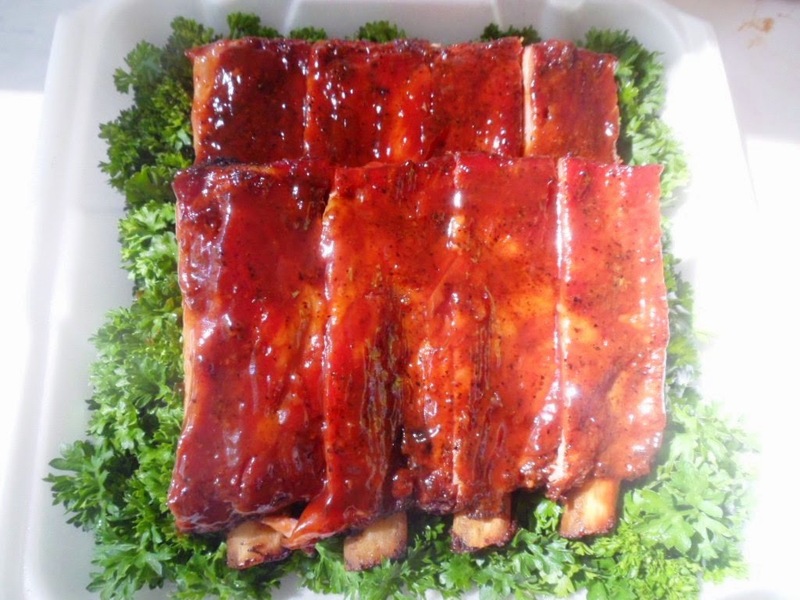 I know the ribs were not evenly done, so some bites were perfect, and some had a little too much tug. We'll try to fix that when we head out again! Wow, it's been a busy summer so far, can't believe it's been 5 months since I last posted. A lot has happened in that time to be sure! We've struggled to get back into the "groove" we felt we were in before I got sick in 2012. Still no calls (to speak of) but we think we're getting things worked out. 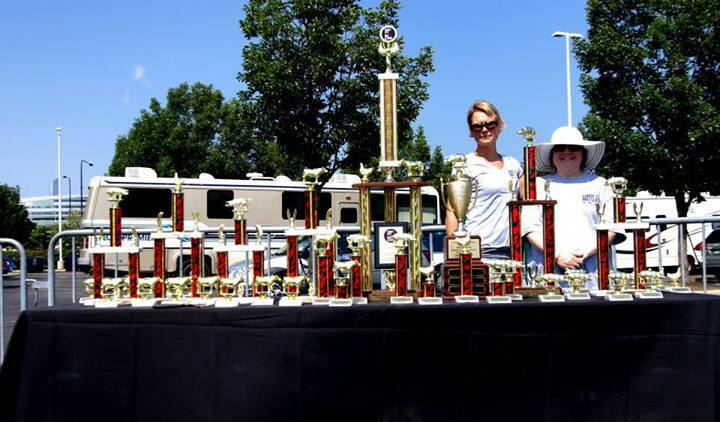 Our first sanctioned contest was in early May, the Masters In May event held in Fremont, WI. This was the second year of this comp, and our second year attending. We arrived on Thursday, as we did last year. 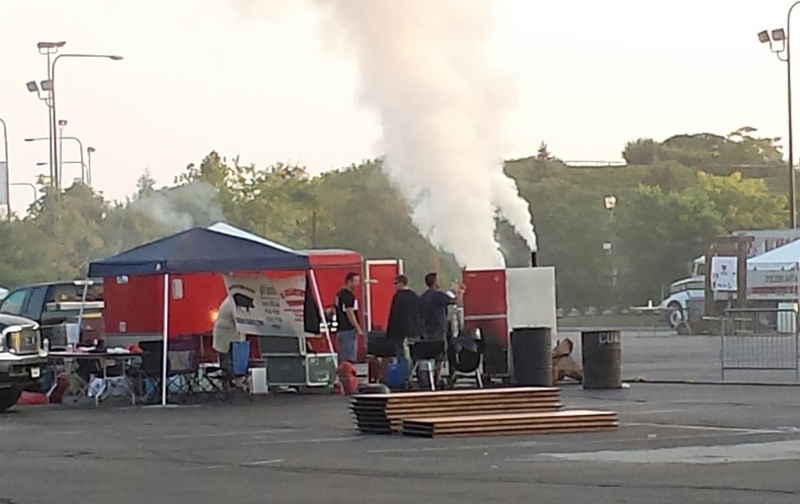 It just makes getting set up easier, and we know we'll be onsite when the meat inspectors come out Friday morning. 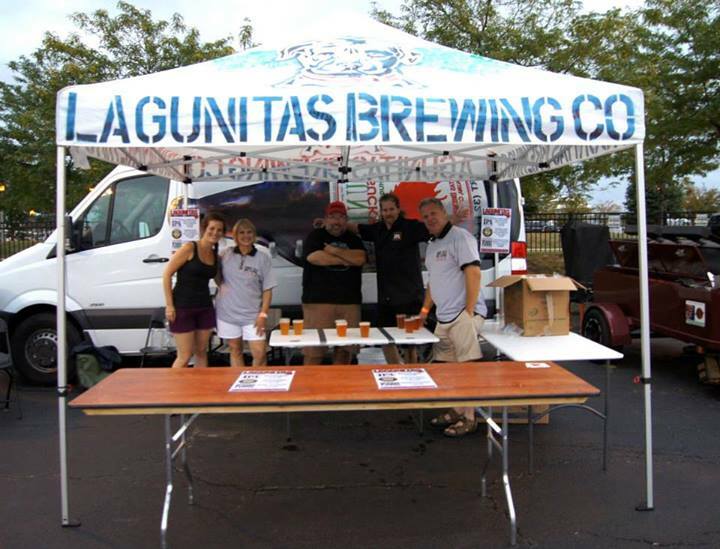 As usual, we had some great neighbors, and all in all had a very nice weekend! Saturday morning, the 9:22 was once again sponsored by the good folks at Jim Beam, who supplied their new maple flavored Kentucky bourbon. Honestly, the stuff tastes like maple syrup! As far as scoring, we didn't have too much to brag about. 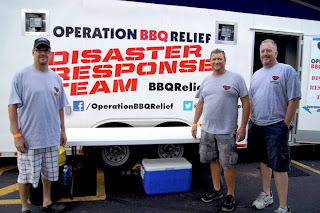 We were 43rd of 62 overall, 53rd in chicken, 15th in ribs (I AM happy about that, we used to do well in ribs and I believe we may be getting back on track here). In pork, we got 57th...sheesh...that hurt! 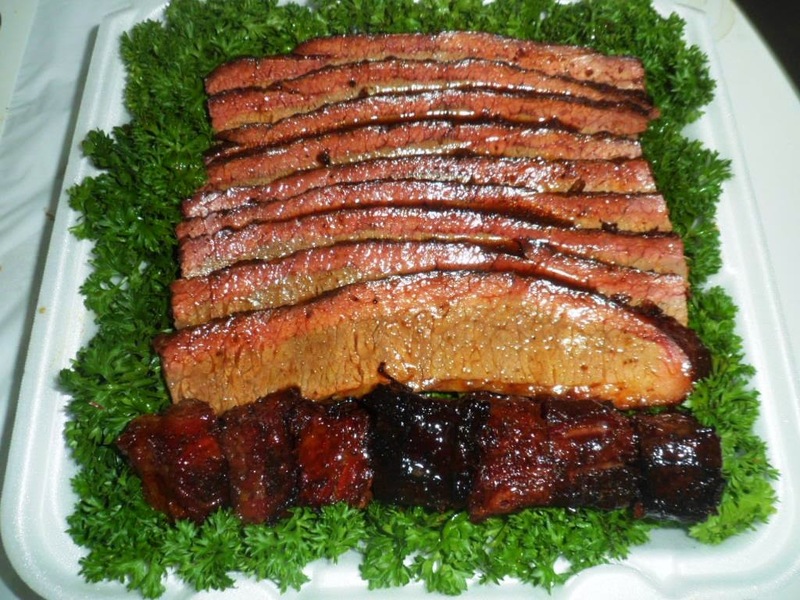 And finally in brisket we were 21st, which, while I'd like to have done better, I can live with. The positive we came away with was that we got everything done on time, had fun, and actually beat a fairly well known bbq restaurateur featured on Pitmasters television show, and a legendary pitmaster known in KC as "the baron" in the overall scores! When it all was over, I rode into town and get some take-out from a great little bar on the river in town called The Bridge. I brought it back to our site, and we enjoyed our dinner, and then spent the evening by our fire pit with our friends and neighbors Moose's BBQ. Next was Westmont, IL, just up the road a couple of miles. For the first of their many years, this years contest was a back to back. Two separate contests, one Friday-Saturday, and the next Saturday-Sunday. This was our first, and likely our last, back to back. It is absolutely just too much work, IMHO. 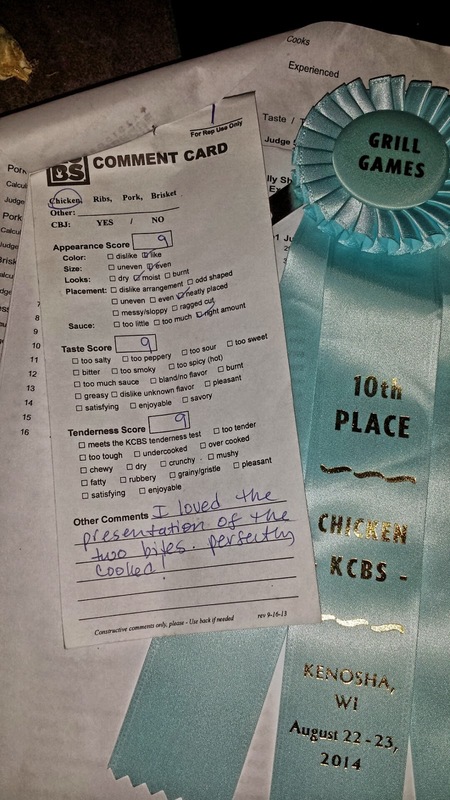 This was also only the second time we'd see the new KCBS score sheet format, which allows a cook to see which tables they landed at, and against which teams. It's an eye opener to say the least! Comp 1 of 2 had 43 teams. 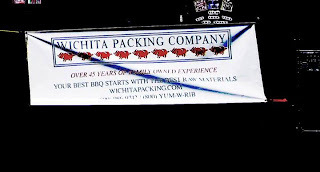 We ended up 36th of 43 the first contest, 33rd in chicken, 41st in ribs (so much for that back on track comment about Fremont, 34th in pork, and 36th in brisket. Just discouraging as all get out. But, we got right back on the horse, and did the second comp. 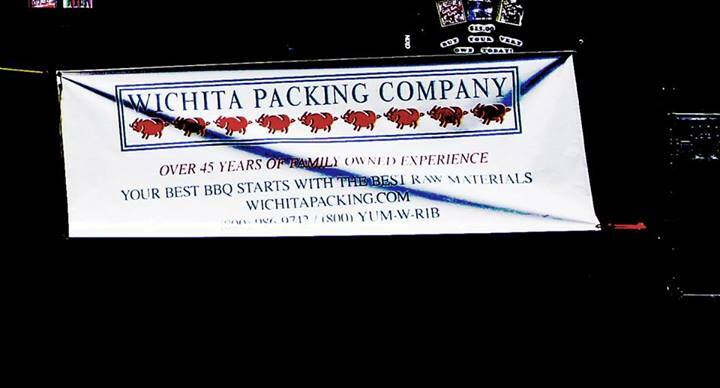 At that one, we did 56th of 72 overall, with 50th in chicken, 62nd in ribs, 46th in pork, and 56th in brisket. Oh, we did get 6th of 13 in dessert. All in all an exhausting (and kind of depressing) weekend. Oh, and the thermistor on our fridge died, so everything ended up freezing up in our fridge. Good think we had the comp meats in the cooler! So now, after 3 comps, while we feel our food was good, the judges didn't disagree. 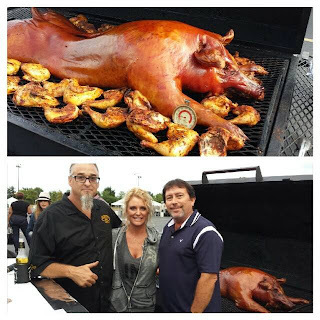 The odd thing is we judged a contest in St. Charles IL this past weekend, and I had some awful stuff, including some pork that I just couldn't swallow, I actually had to spit it out! So I'm confused about our scores, to say the least. We'd intended to go to UP Hog Wild, in Harris, MI this past weekend, but unfortunately, the sponsor backed out and the event was cancelled, which is why we judged at St. Charles. I'll try to get some more photos up in future posts (and make them more frequent) for the rest of the season. 2014 BBQ season is underway! Not even out of February, and the season has unofficially begun! We competed on 2/16 in the annual Des Plaines, IL Winter Burnoff, held as always in the parking lot of Rand/River bowl in Des Plaines, IL. I had a very busy work week, so didn't have a chance to do any shopping or packing until the day before. That made for a fairly hectic Saturday, but I still managed to shop for and trim all the meats (chicken, ribs, sausage, and pork tenderloin, with an optional chili contest) pack the truck, and generally get things readied. 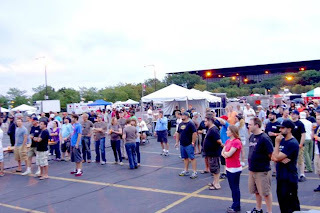 Sunday morning, we arose at 04:30, and got ourselves headed north to Des Plaines about 6 AM. I had been battling some kind of stomach bug Saturday, and still felt pretty lousy Sunday, but we managed to push through and get all the meats done and turned in on time. As to our scores, well, we've done better. 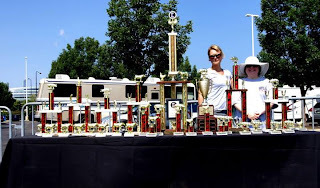 Alas, we had a great time anyway, that might have been even better had I felt ok. What we did feel great about though, was our friend Steve from the South Side Pitmen team, who earned some great calls (and nice trophies) in his first effort at doing this contest. 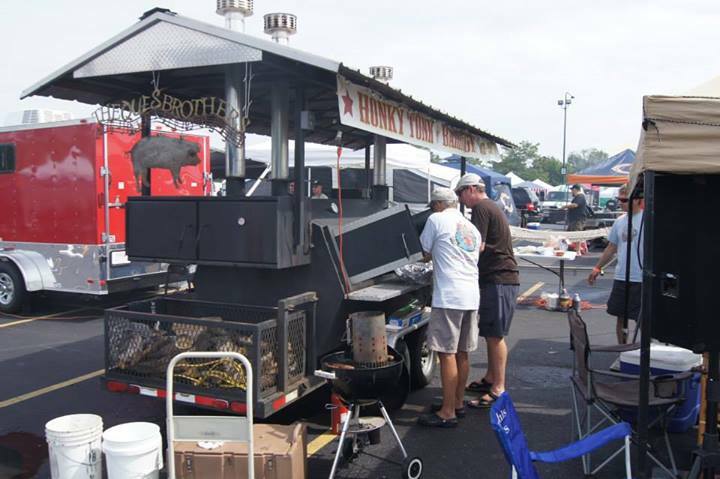 He shadowed us 2 years ago at the event, and lent a hand with setup and tear down, and after completing one KCBS full contest, and a number of backyard events with some success, entered the burnoff for the first time! 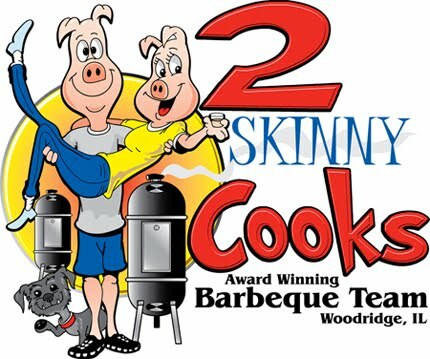 So, with that disappointing start out of the way, we now begin our planning for the true 2014 BBQ season! Hopefully soon, the snow around our trailer will melt, and we can begin to prep for the season ahead! There are rubs and injections to order, there is organizing to be done, and it can't get warm soon enough! 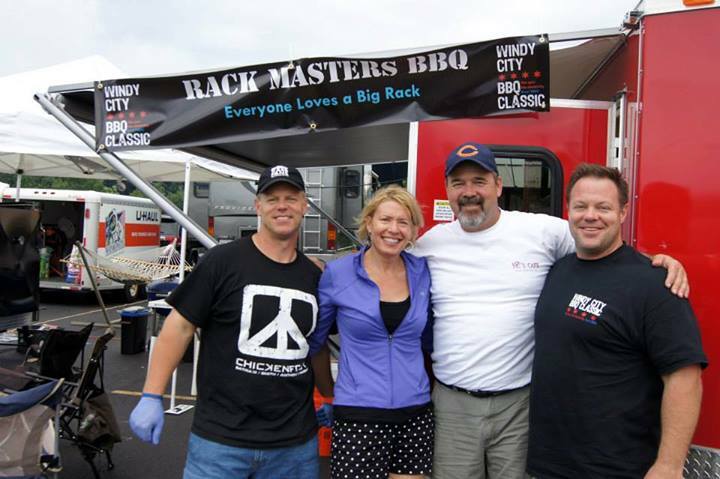 We'll be starting, this year like last, with Fremont, WI for the Masters in May cookoff . There is a 66 team limit at this one this year, and we were in early! Well, it's been quite a while since I added any updates, guess I should close down the year! 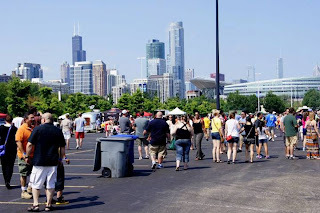 Since I last wrote, we attended the Chicago Gourmet event in Chicago's Millennium Park, sponsored by Bon Appetite magazine, in late September. We have done this almost every year since it started as kind of a mutual anniversary gift to one another. 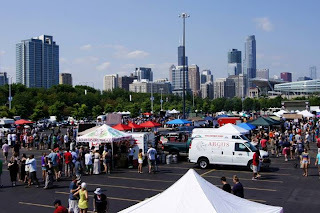 Always some great chefs, the best in Chicago and guests from around the world, great spirits, and just a great day to spend eating and drinking in a beautiful setting. In October, we competed in our last 2 contests of the season. First was Central Illinois Bragging Rights, in Arthur, IL. This year in particular, the weather was just about perfect, the only exception being a brief rain shower at the start of chicken turn-in's. Once that cleared up, we enjoyed a beautiful day! Our scores could certainly have been better, but our main goal this year is to get back into a rhythm of sorts. Our previous 2 seasons were marred by outside influences. In 2011, our old 20+ year old pop-up camper began to self destruct on us. We lost the power distribution box the first contest, the following weekend one of our roof support cables snapped, and at our 3rd or 4th, the AC died. (AC unit had a separate power input from the rest of the trailer) Then, on what was to be our last competition, my trucks fuel pump went south, and we never made it to the event. 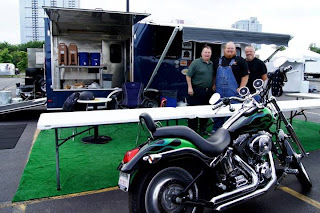 In 2012, we got ourselves a new trailer, and were looking forward to a new, easier season since we would no longer need to set up and tear down our trailer, making setup and tear downs much easier! Instead, our bad luck streak continued, with a season ending (and potentially life threatening) illness. So, after two abbreviated seasons, our goals were pretty simple this year. Compete in 6-8 contests, hope to get a call or two, but most importantly, get the camper set up to the most efficient configuration, and get our timing back after such a long layoff. I also had to work through some lingering fatigue, the lasting after effect of last years illness. So, in the end, although we only got one call all year,(4th place brisket at Windy City BBQ Classic) we still regard the season as a success, in that we were able to compete, we had no DQ's, and no disqualifications. The following weekend was the season closer, at Lambs Farm in Libertyville. One again, no stellar finishes. 37th of 54 overall. Chicken was improved! Right at the bottom of the top half with a 27 of 54 teams. 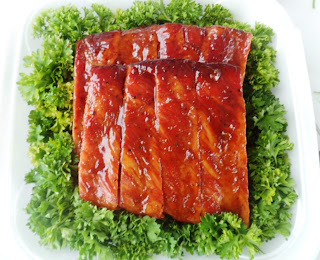 Ribs were also a bit improved from Arthur, with a 20th of 54. 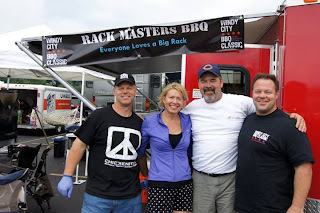 I wasn't happy with my pork, and it showed, with a 48th. 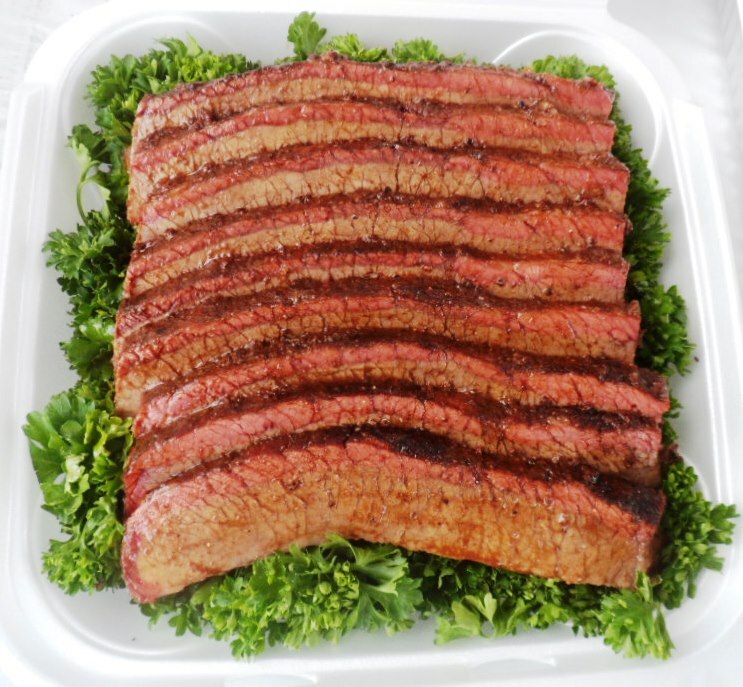 Our brisket was a bit confusing. We thought it looked and tasted outstanding. The judges disagreed, and we ended up 41st. 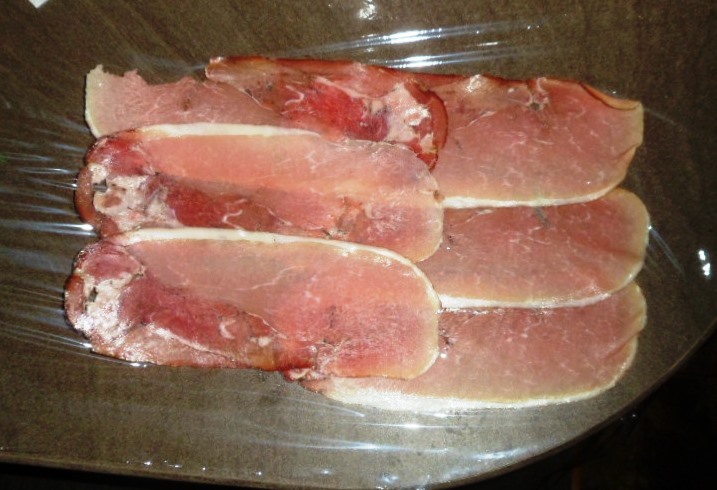 So our 2 best meats (normally) fared the worst! Oh well, once again, we had a great time, made some new friends, and had some great neighbors. 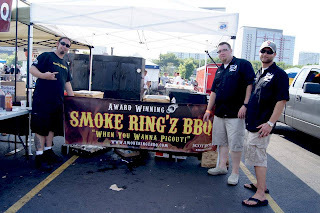 And it was nice seeing our friends Rick and Jim from the Smoke Hunters take Grand Champion with 3rd in chicken, 2nd in ribs, 6th in pork, and 3rd in brisket. They seem to have "dialed it in" lately! So the competition season is now over for us in 2013, our next scheduled event will be the Des Plaines, IL Winter Burn off, some time in February of next year! In the meantime, there's still Thanksgiving and Christmas for BBQ, and with the BGE just outside the back door, I'm sure we'll be eating plenty of smoke cooked eats all winter. OH! And with the advent of cold weather, it's almost time to start making sausage! Anybody got a good Texas style hot link recipe?!? With November starting, we attended what likely will be our last bbq event of the year, but this time, as diners, instead of competitors. On 11/03, we went to Joe's bar, on west Weed street in West Town, that actually includes an OTB on the premises. The event had Elizabeth Karmel (http://www.elizabethkarmel.com/) as it's MC, and there were a number of demos, given by Barry Sorkin, owner and chef at Smoque BBQ in the city, who did a brisket demo. 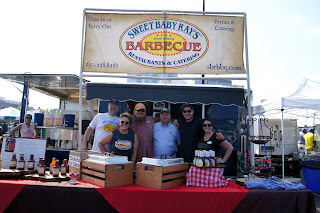 Duce Raymond, of Sweet Baby Ray's BBQ, and the rest of the Duce's wild team did a competition ribs demo, Phil Wingo, of tailgatecharters.com who did a pig roast demo , and finally a butchering demo by Rob Levitt, of Butcher & Larder in Chicago. http://thebutcherandlarder.com/ who broke down a half-pig. 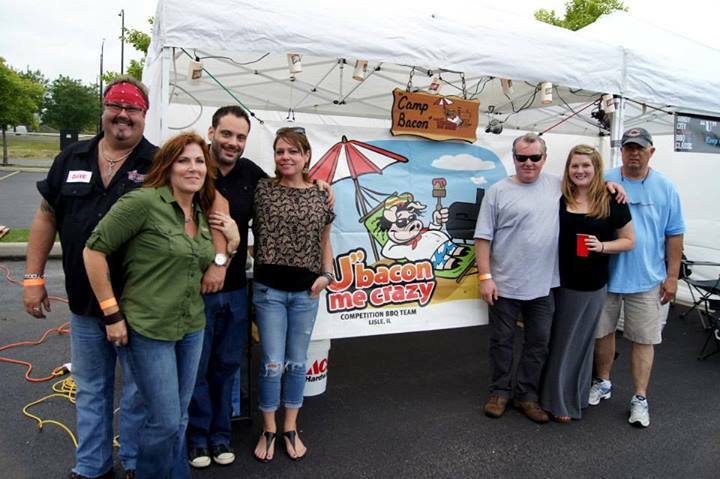 So now it's time to prep for the holidays, and by January we'll be starting up the bbq machine for the 2014 season! Wishing everyone a safe and happy holiday season, and a joyful New Year! 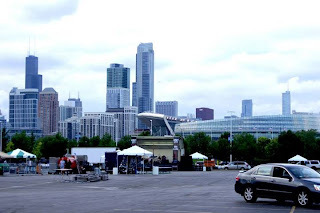 Windy City Bbq Classic - A little progress at last! A few weeks have gone by and I haven't updated, so I guess it's time! This was one of the best venues for a competition in terms of location! In the south parking lot of soldier field, just off lake Michigan with a great view of the Chicago skyline! 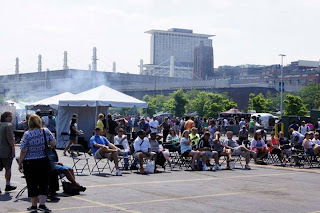 I believe there were 30 teams competing in the main event, and another 30 Vendor/Teams cooking for people's choice awards. In all, I believe the organizers had over 2000 folks in attendance, not including the teams. A good sized event to be sure! The weather leading up to the event was awful, thundershowers 2 or 3 days straight made it a real pain to get packed and ready, fortunately these days since most of our gear is already in the trailer, all that needed packed was the pits, charcoal, table, and some other odds and ends. And as I hitched the trailer to leave, we had a sudden downpour that had me running for cover and held us up another 20 minutes or so. But we finally got ourselves there, only a little later than we'd planned. We arrived about 20 minutes after the 3PM open time (really? why 3PM?) Quite a few folks were already in and set up, so not sure how they were given early access. Ah well. Once we did check in, I was pointed to a 20x20 site. Hmmm...we'd asked for and been guaranteed a 20x40? And the trailer alone is 26 feet from receiver to bumper. After a little talking with the organizers though, we got it all worked out and eventually made it into our site. We checked in, picked up our meat (most comps you buy all your own meats, this one kindly provided 5 nice slabs of spare ribs and 4 whole chickens! 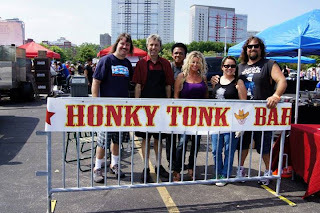 AND 2 pounds of some tasty spicy Texas sausage from Mikeska Brands in ) picked up our "goodie bags" and banners, and headed back to the trailer to start prep! After dinner, we went on back to the trailer, where Ember the wonder dog (and our mascot) had figured out how to escape the collapsible crate we'd bought to keep her in that was supposed to be able to contain up to a 75 lb. dog. (She weighs about 16!) and was standing on the banquet chair, watching out the window for our return! I finished trimming meats and got the pork started on one of the cookers, while also enjoying some of the complimentary beer varieties provided by the good folks of the Lagunitas beer company, one of the many sponsors of the event. Also got to enjoy the fireworks show from Navy Pier! We finally got to bed around 2 or 2:30 AM, and I was back up at 6:30-7 to start on the rest of the meats. At some point, we saw a fairly spectacular grease fire in the pit of one of the people's choice competitors! By the time I was able to snap a photo though, it had been extinguished, so you cant see the 6-8 foot flames that just moments before had been belching out of it! That is definitely not sweet blue! Anyway, first turn in was chicken, at noon, then ribs at one. Already not the KCBS turn in times we're used to as they are usually 1200, 1230, 1300, and 1330 for chicken, ribs, pork, and brisket. So the hour between the first two was kind of odd, nice actually, but not the normal timing. 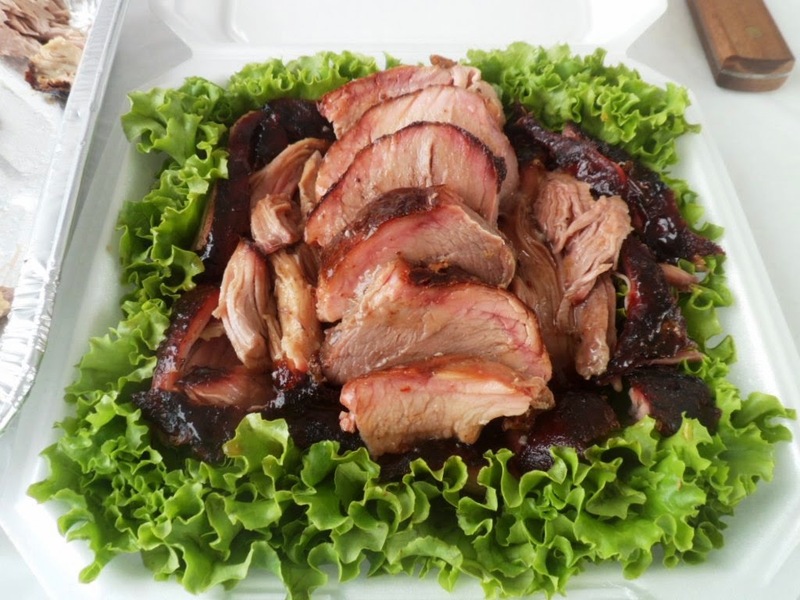 Then pork turn in wasn't until 3PM, and brisket at 4! 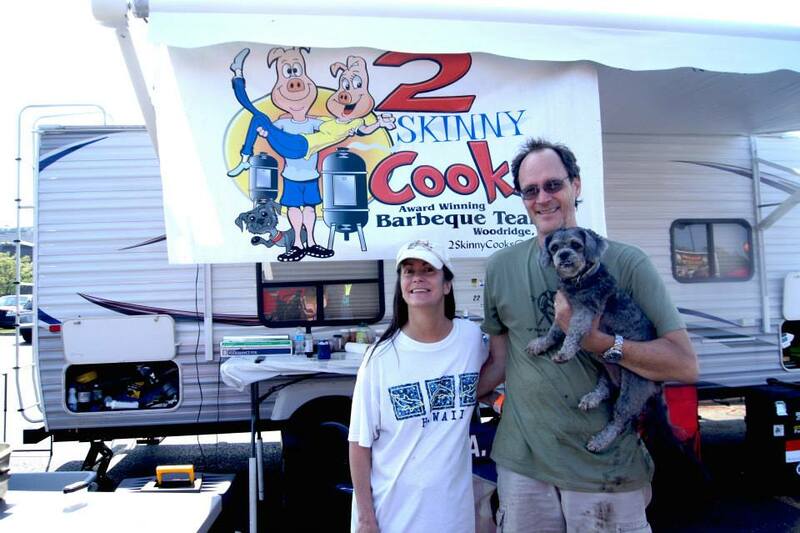 We were happy enough with all our entries, although the brisket kind of scared me. First, it was taking WAY longer than normal to reach the tenderness I was looking for. And by the time it did, it had shrunken to almost half it's original size, which normally doesn't happen. It shrank in all directions, so when I sliced the flat (the lean muscle of the two on the brisket) it was only about half as think as our briskets normally would be. But it was plenty juicy, and tasted pretty darn good, so I was happy! In the end, everything was turned in on time, and now it was time to start packing up until awards at 6PM and see how we did. Now until now, I forgot to say that the organizers had booked some pretty great entertainment for the weekend, and we were treated to some pretty good blues all weekend long! But at around 6:15, the band finally took a break and it was time for awards. Now here was where some confusion occurred. They only announced top 3 in each category. Most contests would do at least top 5, and usually top 10. Not really a big deal, except that, if you'd won a prize/trophy anywhere below 3rd place, there was no real way to know. So we kept going back and checking with people until finally, when the place had almost cleared out, someone told us we had a trophy waiting. 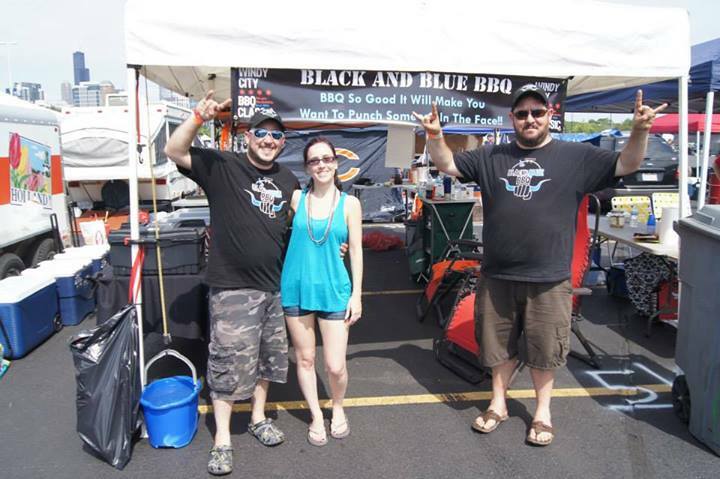 Turned out we'd won 4th place brisket, a trophy, a check for 100.00, and 10th overall! Trying to work the whole prize thing out delayed me getting everything packed and hitched, so by the time we left, we were about the last ones out of the parking lot, although quite a few teams were all sequestered at the north end of the exit, talking and visiting. All in all, they'd expanded the event exponentially from the first years, so hopefully they will continue to improve as they go! Here are a few more shots of the event, courtesy of Derek Johnson, of Custom Image Photos in Chicago! 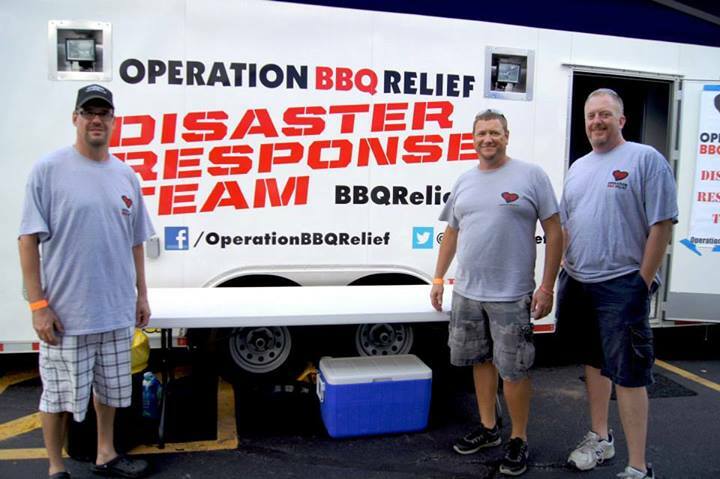 They are in Longmont Colorado now providing food to the volunteers and victims of the horrendous flooding of the past few days there! We got a week or so rest, and then last week Wednesday drove up to Sturgeon Bay Wisconsin to set up and cook for our friends and former neighbors whose middle son was getting married. 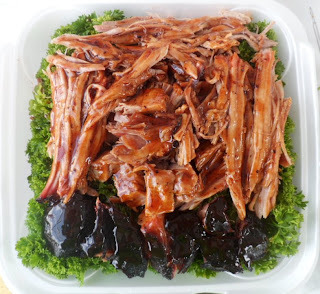 Last Saturday, we served about 50 pounds each (pre-cooked weight) pork of pork shoulder and brisket, along with apple baked beans with bacon and chopped bbq, spicy Cajun boiled new potatoes, cucumber salad, Cole slaw, beet and mandarin orange salad to around 140 hungry guests! I guess they liked the food as many went back for third and fourth helpings! Firin' Up the Fox - St. Charles, IL. Ouch! It's been almost 2 weeks since our last contest, and I still haven't published a blog entry! Time to fix that! Well, third contest since, well, since we came back from "hell year" and looks like maybe we're stuck in the mud! Or maybe judges are changing, not really sure! Our 4th of July weekend started off pretty well. 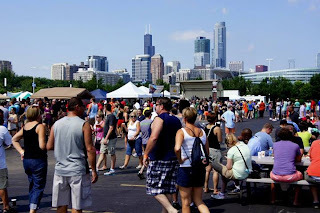 Our village (Woodridge, IL) puts on a picnic each 4th of July, including inexpensive hot dogs, brats, chips, beer, ice cream, etc. There is also a band that has been there every year we've gone that plays a mix of polkas, classic rock, and a little dance music. 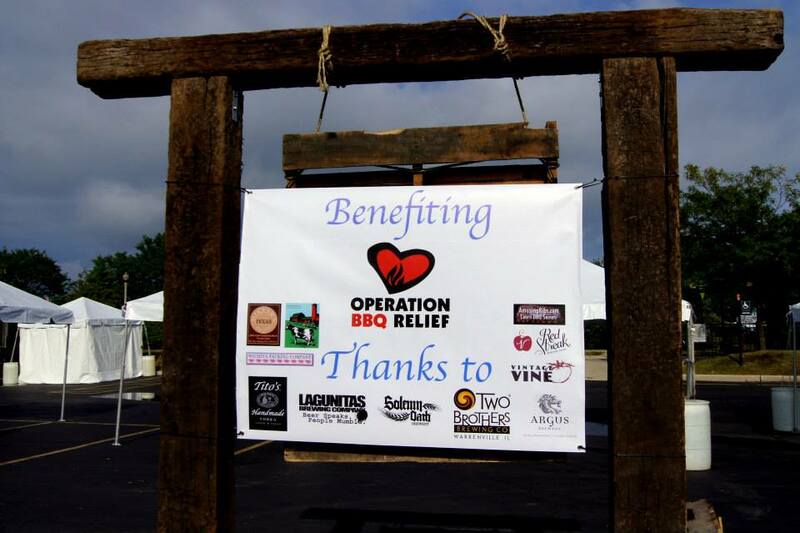 We try to volunteer to assist in the pavilion where the brats and dogs are prepared each year. I had to miss last year as it was my first day of in-patient chemo, but Diane did it. This year mostly went well, but shortly into service (picnic goes 11AM to 3PM) Diane was a bit overcome by the heat, and had to spend the rest of the picnic just resting. My job this year was different, to say the least. Normally the brats come individually packed in cases of around 50 each. This year, inside each case was 2-5 lb. bags of brats still linked together! So my job was to separate individual links, about 50 to a box to make them easier to grill! Good thing I brought a sharp knife with me! We got a few things set up, and got the smokers unloaded and set up. But mostly, we just visited a little with our new neighbors, got things set up inside the camper, and got a good nights sleep before the comp really started on Friday. Good thing we got that sleep! We wouldn't get much more that weekend! 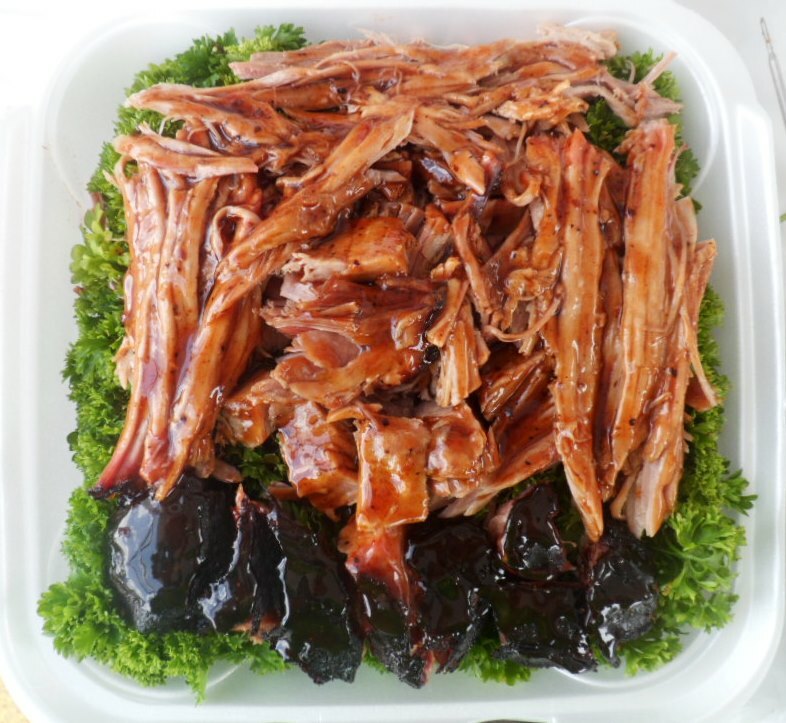 Friday morning, Di continued to straighten up inside as I unloaded and set up the cookers, our prep table, and, once our meat was inspected, began prepping. Oh, I also put up our new, 20' flagpole! As a veteran, and senior vice commander of my VFW post, I wanted to be able to properly display the colors. So I got a collapsible 20' flag pole, with a mount that goes under the wheel of either your vehicle or trailer. Wasn't much of a breeze Friday morning, but here it is...The blue flag under the stars and stripes is my submarine force dolphin flag. To wear or fly the dolphins means you were submarine qualified. Not an easy task, I assure you! These things ROCK! If you grill even once a month, you owe it to yourself to try them. They're great as advertised, but if you turn them upside down, you can get a great full sear, instead of just the usual "attractive grill marks" And they almost totally eliminate the potential for flare ups, and food lost between your conventional grill grates, or as my wife says, sacrifices to the fire gods! The evening went well, a few folks stopped by to chat, and then we did an abbreviated "shot fairy" round fairly late in the evening. I think we went to bed around 1AM or so, but our next door neighbors had other ideas. Their party went on until around 3:30 or 4AM I think. Kind of surprised nobody complained. 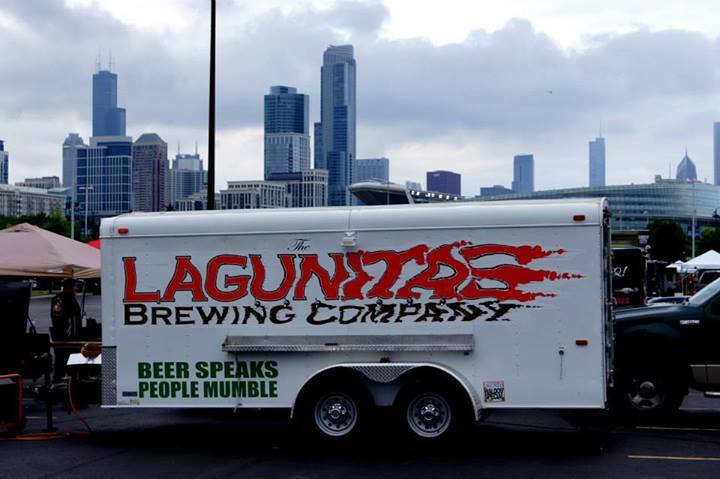 For us, it was a bit of deja vu, as 6 years ago, at our very first competition in Westmont, IL, we had the same next door neighbor. Kept us up all night that time too, and blamed it on his "evil twin" ARGH! He knows who he is! Woke up Saturday morning around 5:30. Well, I never really fell asleep, but that's when I got up! Started the big smoker, and got the brisket loaded in. Also started getting the seasoning on the ribs, and re-stoked the coals on the smaller smoker. Pork at that point was just breaking the "stall" and was about 170 or so internal temp. 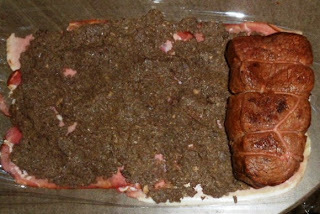 then put the beef on one end, and rolled into a nice, tight package. I wrapped it up in rolled out puff pastry after that, but forgot to take a photo, as by that time, it was about time to wrap the brisket, and start the chicken. So now, on to pork. And this ended up being another one I just wasn't quite happy with. I think my timing is just off after being away so long, but this pork was just a little too overdone to get any decent slices, of money muscle, or any other piece. So we settled for pulled and chunk, in a box I was less than happy with. Thing is, turning in anything is better than turning in nothing! Finally, brisket time! And for the first time all day, I thought we had a chance with this one! 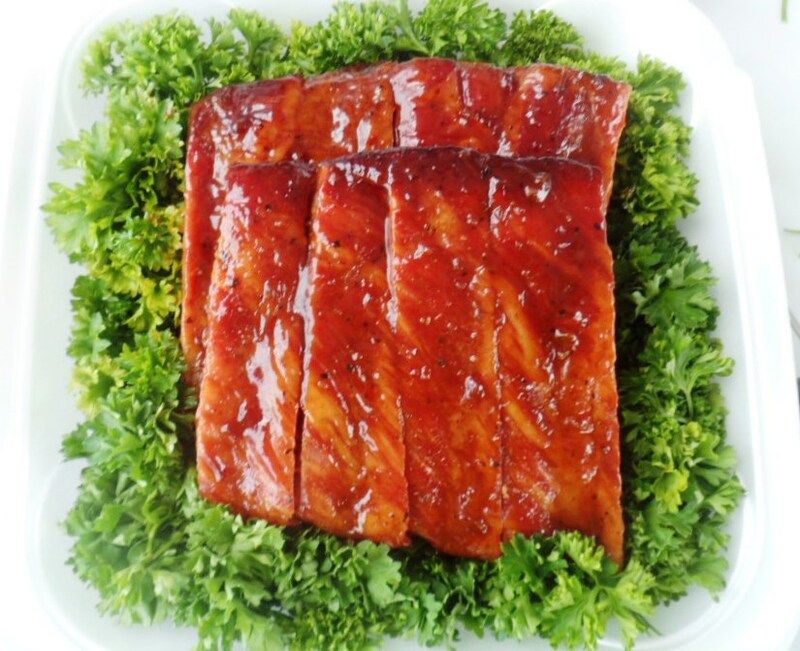 Beautiful, juicy, perfect tenderness, only thing wrong was the point could have cooked longer, but usually, if your burnt ends/point aren't good, you don't put them in the box, and we didn't! After seeing the photo, I saw the garnish was a bit sloppy and straightened it out before Diane took the box, but it was 15th, we would find out. Our closest to a call all day, well, at least of the main 4 categories. They turned out about as perfect as I could have hoped. A nice mid-rare, pretty tender (for top sirloin) and tasty. I trotted them in to the turn in area, and....was told I was a half hour late! If I could, I'd include a sound byte here of the wind going out of my sails! Well, as it turned out, it wasn't one of the main 4, so as the rep saw it, it was up to the organizer to decide if they would let the judges taste it or not. He took one look, and said yes, so, despite the late turn in, it went off to the judges. I went back to the trailer, and told her the good/bad news, and we waited. Turn in's for all categories were done at around 2:30 or 3 I think. 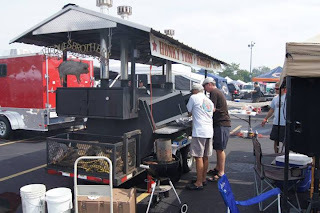 About 3:30, the rep and organizer came to our trailer to tell me they were sorry, but we'd been disqualified, because, although it wasn't one of the KCBS main 4, the Ranchers Reserve series was part of a partnership between KCBS and the RR folks. So a call went to KCBS, and Carolyn Wells said (and I believe rightly so, in case anyone thinks I harbor bad feelings) that it needed to be dq'd.....Rules, after all, are rules. They DID tell us, that, prior to the DQ, we'd scored 2nd place, which would have been good for about 700 bucks I think! Alas, we went home with no award money! We went ahead and decided, rather than pack up in the Saturday afternoon heat, we'd let the sun go down, take our time packing, and hang around and judge the kids and amateur comps on Sunday. That gave us a chance to get a good nights rest, and we had everything hitched up and ready to go Sunday AM, so we could leave when we were ready. Di stayed with Ember, and visited with some of the teams, while I went in and table captained for the 2 contests, kids and amateur. The kids were divided into 2 age groups, and each were given one of those little disposable one use tailgate grills, and a pork steak. The results were excellent, beyond any of our expectations!! Really good, really tender, I don't think we had a bad piece of meat! The amateur category cooked ribs, and chicken. 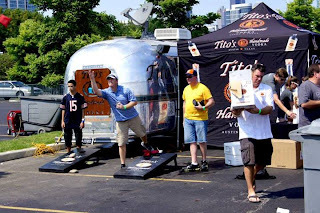 I was table captain for a group of non-certified (except for 1) "celebrity judges, that included 4 local community folks, and Ina Pinkney, of Ina's restaurant in Chicago. I haven't eaten at her establishment, but hope to do so soon, she's a very nice lady! Overall, had a great time (I haven't judged or table captained in over 5 years) and hope to do it again soon! We had a great weekend, and, despite our poor scores, I think the organizer did a great job for a second year comp, and we look forward to doing it again next year! 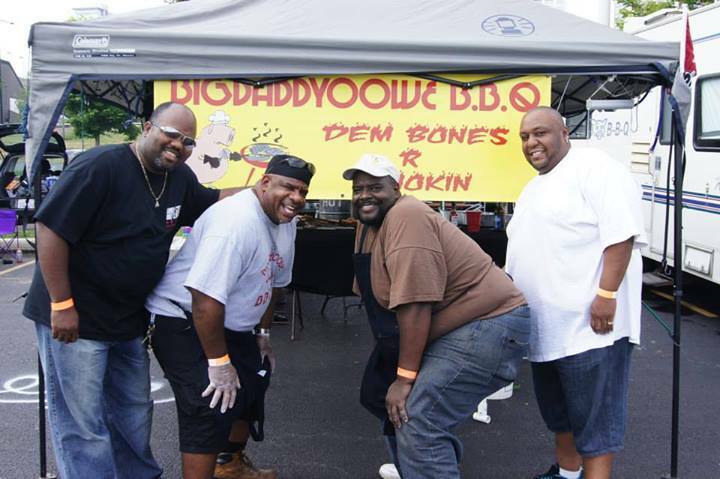 For now, we're taking a little bbq break, our next event will be Labor Day weekend! 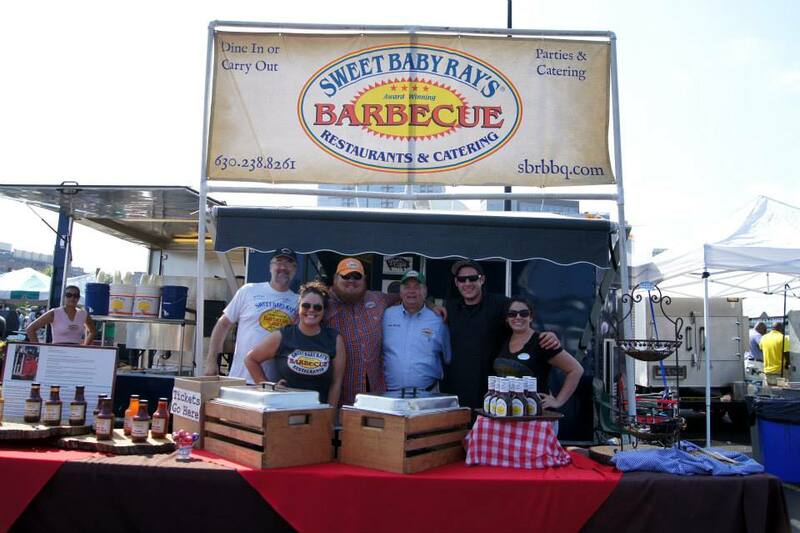 Hope to see you all somewhere along the bbq trail! We want to thank our BBQ freinds and our families for thier support, prayers, and well wishes in 2012 & 2013, and look forward to seeing them in 2014!